The grab-and-go camera control for your smartphone. ShutterGrip instantly transforms your smartphone into a serious camera. 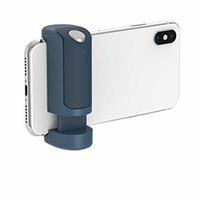 It uses a tensioned grip to attach to almost any smartphone - case or no case - and provides a solid, ergonomic handle and wireless shutter button. No more shaky shots or photographic fumbles. With a tripod screw, lanyard hole and non-slip grip, ShutterGrip make it easy to attach accessories. And the ingenious modular design allows you to remove the shutter button to use as a remote control for selfies, videos and time lapses - making this a must-have accessory for any true creative. 2.80" x 1.60" x 1.20"